http://web.archive.org/web/20140214203506/http://www1.bbiq.jp/gdgdgdgd/ His site thing found using web.archive.org. 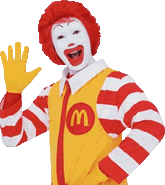 Origin: He's the main Mcdonald's mascot. Monk is missing. Also made by Kishio.